A Scot accused of a gold bullion fraud has been placed on the FBI’s most wanted list, we can reveal. 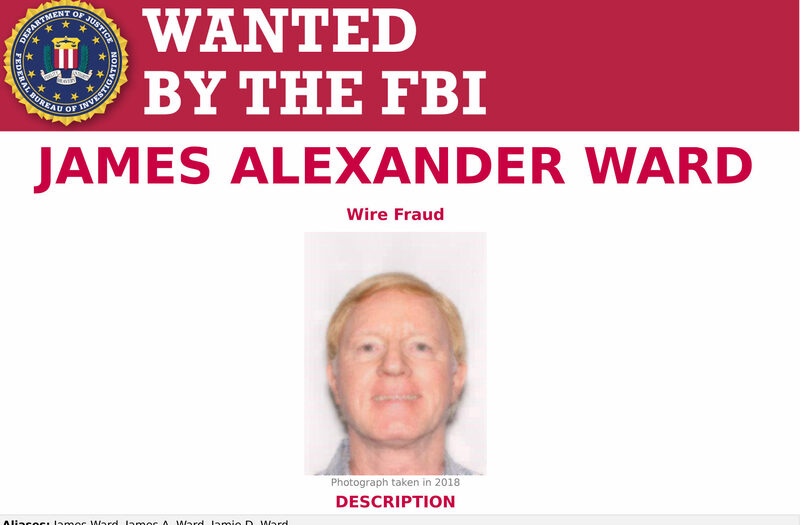 James Ward, 65 has been on the run for six years after being accused of ripping off victims in Fort Lauderdale, Florida. Ward, who was first accused of violating strict US commodities, law, along with his business partner Nathanial Walker, in 2011, allegedly blew £8,000 in one trip to a supermarket. If caught and brought to justice, Ward will be forced to pay millions of pounds in asset forfeiture and civil penalties. Investigators allege when suspicious customers began questioning him about their investments, Ward emptied the bank accounts of his firm Kastle & Hawke and ran off. Ward and Walker allegedly told prospective customers they could buy precious metals using loans, allowing them to purchase more than they could afford. It is understood they used “high pressure” boiler-room sales tactics to target retirees who flock to Florida for the sun, sea and golf. Court papers allege Ward took £350,000 from at least a dozen victims between 2007 and 2010. Customers were told they only had to pay part of the loans, with the reassurance that by the time they came to sell their gold and silver, prices would have increased substantially more than interest rates. However, the bullion, which was supposed to be held in specially guarded vaults, never existed and victims were left facing huge interest rates and fees. Court documents reveal Ward allegedly told desperate customers a series of lies, claiming “problems in London” were making trading in silver difficult. When one customer demanded Ward sell the 2,500 ounces of silver allegedly in this account and return equity of around £20,000, the victim was given excuse after excuse and charged interest. Another victim wanted Ward to sell £30,000-worth of palladium. However, Ward is said to have lied, claiming “rogue agents in London” made it “impossible” to sell palladium. Before investigators could seize victims’ funds, official documents allege Ward refused to answer questions and emptied bank accounts. Prosecution papers detail how Ward told those he duped that their gold, silver and platinum was being guarded at a secure depository in Delaware. But like the non-existent bullion, the depository was a figment of Ward’s imagination. The court are seeking to confiscate any assets owned by Ward, including anything their can find overseas, to repay victims and court costs. Yesterday, the FBI issued a “wanted” poster for him urging anyone with information to contact its Miami field office. It reveals Ward, who also uses the name Jamie, regularly dyes his red hair and uses aliases. He is known to travel to Mexico, Canada, Northern Ireland and Scotland. His family say they are “shocked and stunned” by the news, saying they last heard of him working in the securities and finance industry in Canada. One family member said: “This is a total shock. I’m stunned. I never thought we’d ever have anyone in the family wanted by the FBI. Born in Dalmarnock, Ward spent his childhood years in Glasgow’s Duke Street. His father worked in the Govan shipyards. After leaving Glasgow, Ward spent years in London working in finance before emigrating to Canada in his thirties. The US Government has recently pledged to crack down on scammers who operate similar schemes netting unscrupulous billions. The Commodities Futures Trading Commission has targeted and shut down hundreds of firms offering similar deals. One such firm lost around £300 million of victims’ money. The US has strict futures trading laws and strict rules over high-pressure telemarketing sales. In 2007, Ward and Walker were sanctioned by the National Futures Association over high-pressure sales tactics while working for a Florida finance firm. In 2011, Ward’s firm Kastle & Hawke had its accounts frozen by a court order which also prevented documents being destroyed.